In 2001, a psychology student name Stephanie Keep took one of my GIS workshops and really grooved on the technology. In her senior year, Stephanie became our first GIS Rock star at Smith because she conceived of an idea for some very novel research. 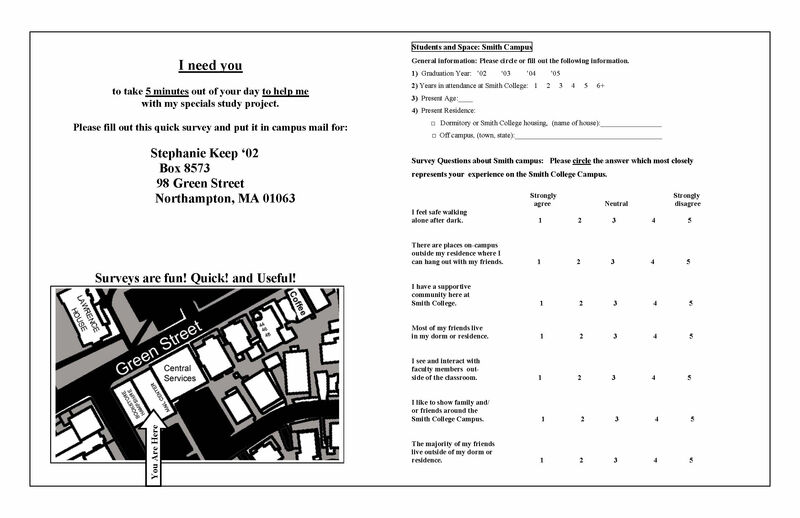 Stephanie was interested in how students perceive their local environment, specifically the Smith Campus and downtown Northampton. So, she constructed a survey that was essentially a map asking students to locate areas that satisfied answers to various questions. Some of the questions included where students “hang – out” with their friends, or where student feel least safe on campus. 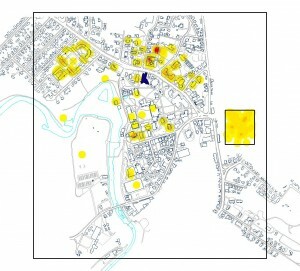 She then compiled the results to produce a density map of student’s perception of their environment. Stephanie’s research predated all of the hype associated with “crowd sourcing” and social networking. 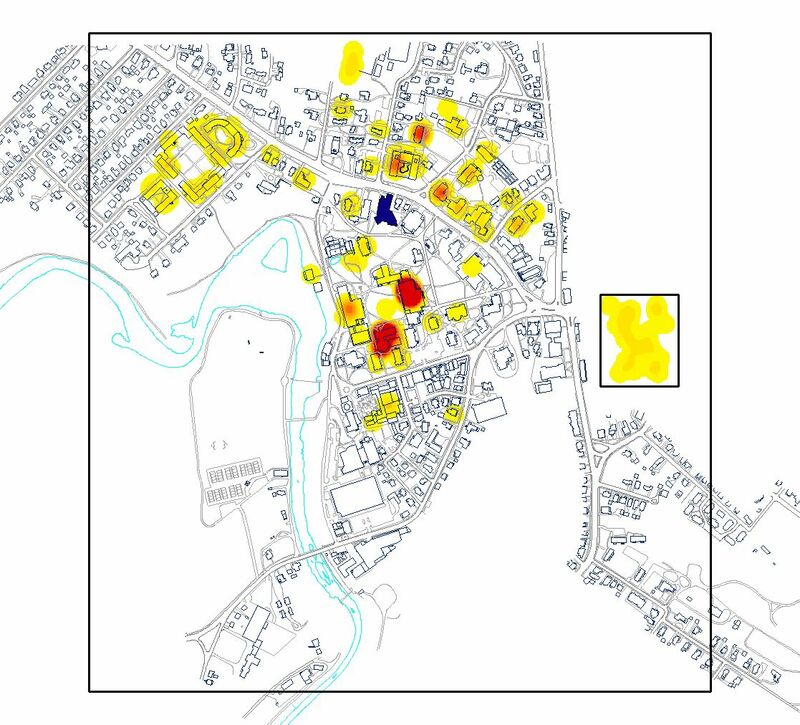 By soliciting what is now called “volunteered geographic information” or VGI, Stephanie transformed student feelings, opinions, and perceptions into visual geographic space. Needless to say, the patterns were quite interesting and very revealing. 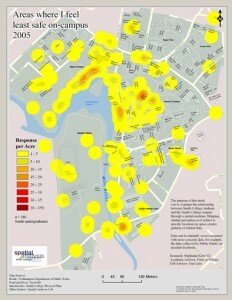 The administration and public safety consulted the maps to help determine where new lighting should be placed on campus. 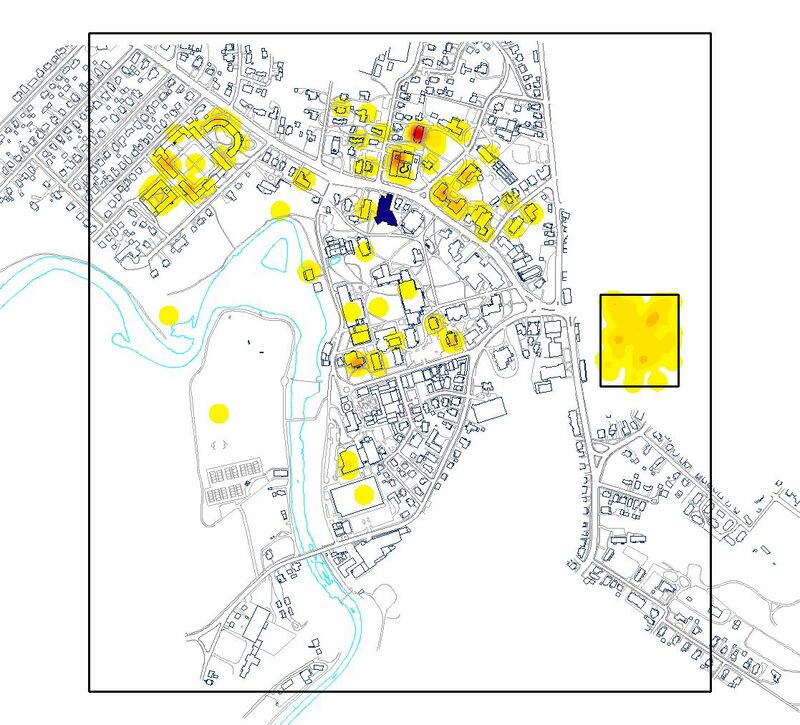 The purpose of this study was to examine the relationship between Smith College students and the Smith College campus through a spatial medium. 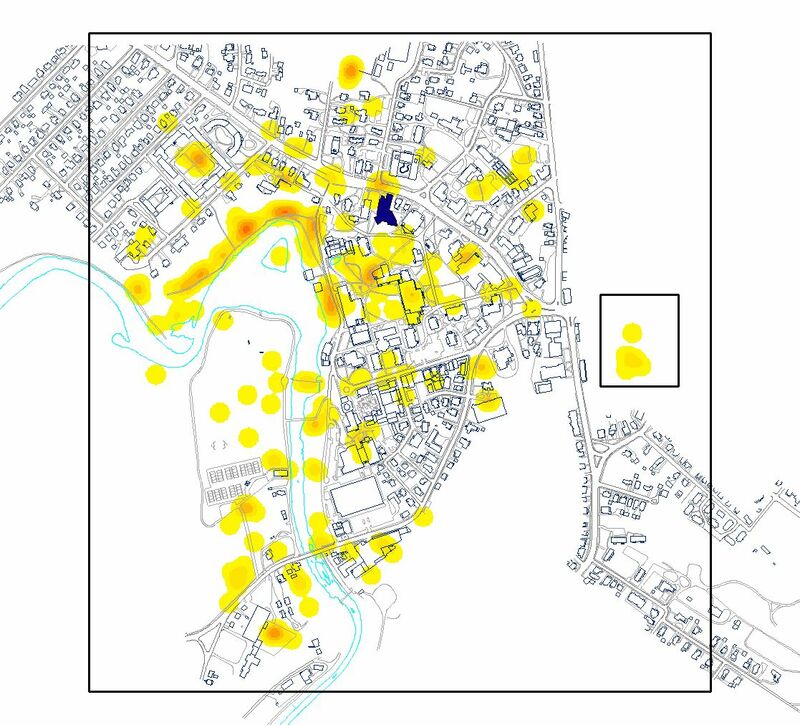 Mapping student perception as it relates to specific locations in space creates patterns of related data. 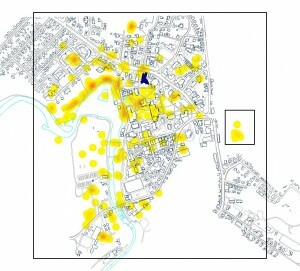 Data can be similarly cross-compared with more concrete data, for example the data collected by Public Safety on incident locations (Keep, 2002). 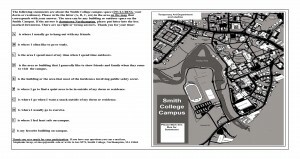 It is strongly indicated by this study that the Smith Campus is a wonderful environment for the Smith College students. Because students spend up to four academic years in-residence, it is important to recognize student’s thoughts and feelings about their campus. 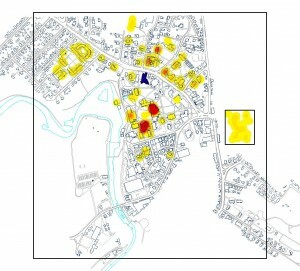 Mapping affect and perception could be helpful for future planning. Currently the building of the new Campus Center offers an opportunity to see how the planning of the Smith campus impacts student perception of place. Follow-up studies could be conducted to see if there is a change in student perception after the Campus Center is completed. Perception of environment provides a meeting place between fact and fiction, a place we often call reality.